You're an undergraduate at Yale University in New Haven, Connecticut. Your studies keep you busy, but when you have free time you spend it at the airport up in Chester, where you're always looking to earn a little cash. You've had your commercial pilot's ticket since your senior year of high school, and whenever you can you take on special flying assignments for Chester Flight Services-the small general aviation and air express service here on the field. This week, Yale is on Thanksgiving break, so you've been staying around the Chester hangar for the past three days, logging lots of commercial time on a variety of assignments. Right now it's another clear, crisp afternoon. You're returning from a late lunch and have just stepped from your car when you notice a flurry of activity out in front of the hangar. Several of the Chester Aviation employees are milling about, apparently inspecting a strange-looking pile of luggage that's been stacked helter-skelter near the far end of the open hangar door. As you approach, you notice with amusement that it's a pile of outdoor equipment—fishing-rod cases, tackle boxes, even a small outboard motor. You scratch your head, wondering who's going on vacation, when Skip, the manager, waves you aside. The equipment is an air express shipment destined for Canada. Chester Aviation has the first leg of the trip and Skip assigns you the job. You're to drop the shipment off at the Marine Air Terminal at La Guardia in New York. From there it will be loaded onto a float plane or amphibian to be provided by a Canadian firm, which will then deliver it to some remote fishing camp up on Lake of the Woods. So, while they load and stow the equipment on Four Six Foxtrot, you head toward the office to check the weather, prepare your log, and file IFR. Chester has no facilities, so when you're ready to go, you call back and copy your clearance on the phone. You have excellent VFR conditions with no change expected through the evening. Winds are from the northwest. 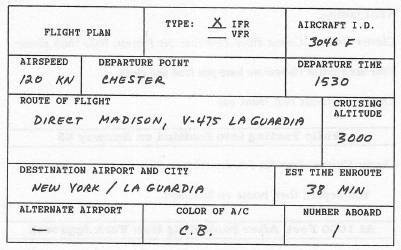 You select the likeliest route to La Guardia—direct to Madison, then Victor 475 all the way. From Madison, the airway proceeds outbound on R-282 to Seamo Intersection, where it bends to pick up the Hartford-La Guardia R-242. Three thousand feet should be fine. You notice the wind is from the northwest, so you taxi to depart on Runway 35. 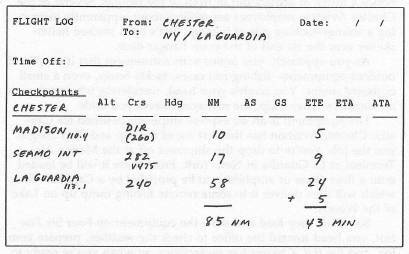 Chester Unicom, Cessna Three Zero Four Six Foxtrot, radio check please. Four Six Foxtrot Chester we have you loud and clear. Chester, Forty-Six Fox, thank you. Chester Unicom, Four Six Fox departing on 35. You depart, then home on Madison. Four Six Foxtrot squawk two two two zero. You consult your chart: V-229 runs from Madison to Kennedy—a distance of 76 nautical miles—on R-242. You set up to take R-242 from Madison and estimate your ETE for Kennedy. 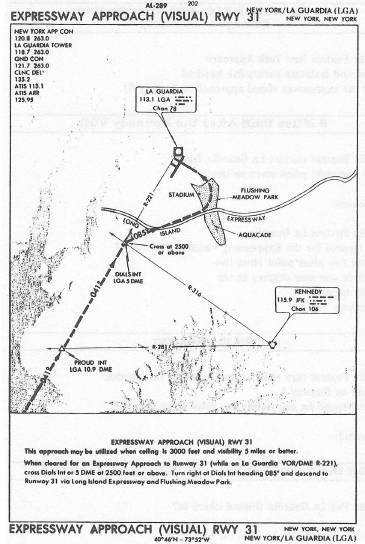 Expect the expressway visual approach to Runway 31. On one one eight point seven so long. Contact Ground on one twenty-one point seven good day. Four Six Fox La Guardia Ground where to? You request the Marine air terminal. And pick up the yellow follow-me truck.